Madhur Jaffrey is the author of seven previous cookbooks, including the classic Invitation to Indian Cooking and Madhur Jaffrey's Taste of the Far East, which was voted Best International Cookbook and Book of the Year for 1993 by the James Beard Foundation. She is also an award winning actress with numerous major motion pictures to her credit. She lives in New York City. Ms. Jaffrey is undoubtedly the foremost authority on Indian cooking in the west. 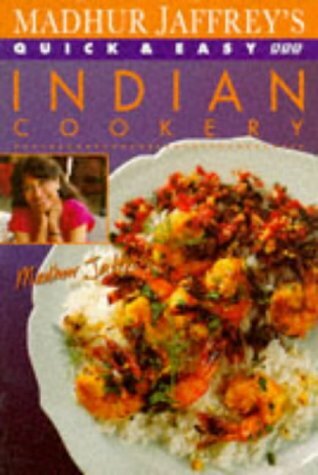 To her goes the credit for making Indian food a familiar cuisine. She gave it a new identity and spirit. In many ways, Ms. Jaffrey took Indian food back from where it came, Indian homes, villages and streets. Reading A Taste of India, is like reading an Indian Travelogue. Ms. Jaffrey makes food even more exciting with her personal reminscences. With photographs and recipes from across India, she covers in style and ease the diversity and richness of Indias ancient, and, very to the minute heritage. Madhur Jaffrey's Spice Kitchen : Fifty Recipes Introducing Indian Spices and Aromatic Seeds - A taste-tempting introduction to Indian cookery presents a selection of recipes for soups, appetizers, main and side dishes, garnishes, drinks, and desserts that use a variety of different Indian spices. 12,500 first printing. A photographic culinary tour of India presents 130 authentic recipes from eight separate regions of the country, introducing the traditional specialties of Goa, Kerala, Gujerat, Delhi, the Punjab, Rajasthan, Tamil Nadu, and Bengal. 15,000 first printing. As an actress, TV presenter and writer, Madhur Jaffrey has many strings to her bow, but it is for her cookery that shes best known. She can single-handedly take credit for igniting the home cook's interest in Indian food in this country and making it more popular and accessible. Ironically, though, as a child she never went into the kitchen and when she left India, couldnt cook a thing. Born in Delhi, Madhur Jaffrey left India at the age of 19 to pursue her passion for acting by studying drama at the Royal Academy of Dramatic Art in London. It was here that her love of cooking began, though more out of necessity than anything else. While in London she desperately missed Indian home-cooked food, so she started writing letters to her mother asking to be taught how to cook. She would be sent regular recipes and effectively learnt to cook by correspondence.